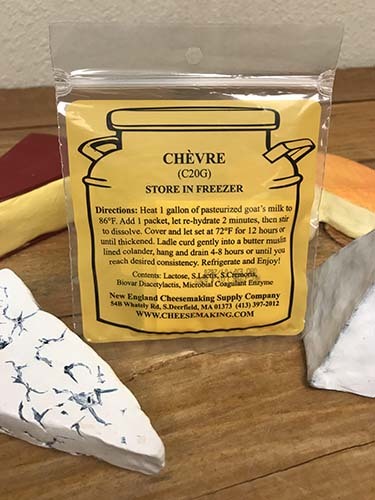 When The Beverage People undertook teaching cheesemaking back in 2007-2008, one of the biggest challenges was the soft-ripening category of cheeses, such as Brie, Camembert, Valençay, St. Marcellin and others. These are the creamy full-flavored cheeses that we love so much. 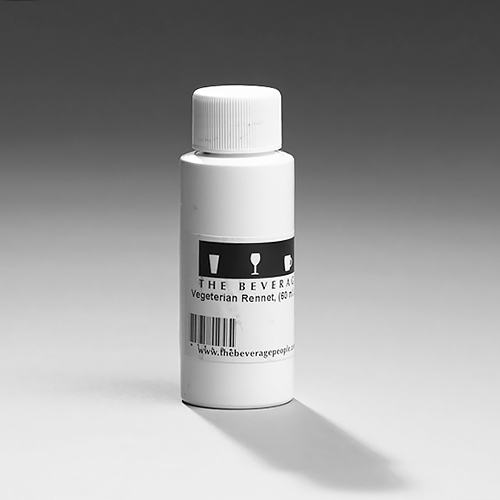 They are made in various shaped molds to create specific whey drainage as well as classic appearance. 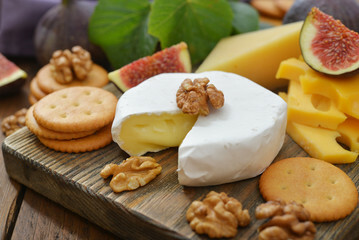 Soft ripened cheeses require more temperature and humidity control than quick cheeses. A spare refrigerator can be a big help to allow you to control temperature, but a cool cellar or wine refrigerator will also work. You will be given instructions in the recipe to help you keep the cheese at the right humidity and temperature at each stage through ripening. So how do you make this cheese? Well, begin by relaxing about the curd making steps, because they are quite standard and easy to follow – and almost always successful. Follow the recipe like any cheese. Where you can really help the outcome happens during the blooming stage when the secondary cultures promote the growth of the rind formed from geotrichum candidum and penicillium candidum. This recipe makes three rounds, about 12 ounces or 4 minirounds about 9 ounces each when complete. The bottomless mold makes it easier to flip and unmold the cheese in ageing. 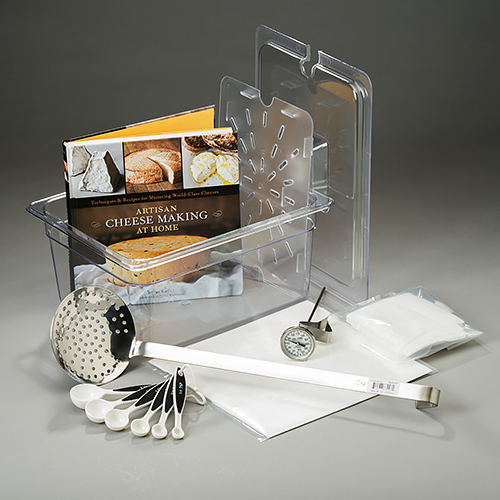 You may provide a room with high humidity for ripening, but it is more practical to use the plastic ripening box for a clean and confined container that fits in the refrigerator. The ripening phase will vary with size of cheese, temperature of storage and even the milk, but plan on maturing this cheese for 4-6 weeks. 1. Gently warm milk to 88-88° F. in a kettle set in a double water bath. 2. Add Calcium Chloride water and mix into the milk with 20 top/bottom strokes. 3. Sprinkle the MA4001 Culture, Thermophilic Culture and both the Candidum powders over the milk surface and let dissolve for 5 minutes before stirring. Mix into the milk with 20 top/bottom strokes. Adjust temperature to 90°F. 4. Wait 1 1/2 hours and then add the Rennet water and stir well. Cover and allow to ripen for 1/2 hour or longer. 5. Sterilize the molds and curd knife while waiting. 6. Check the cheese for a clean break, then cut the curds into 1/4” cubes. Gently stir the curds for 2-3 minutes. The mix will break down somewhat to resemble cottage cheese. 7. Let the curds settle for 10-15 minutes without stirring and then pour out as much whey as possible. 8. Ladle the curds into the Camembert Molds, draining whey until the cheese thickens. Continue to drain the excess whey from the drain pan, keeping the cheese elevated from the drained whey. You will continue this process of draining off the whey for a few hours. 9. When the cheese is firm enough to be handled, usually about 2-3 hours after molding, the wheels should be flipped. This will give an even surface to both sides of the cheese. 10. Continue to flip the cheese a few times over the next 12 -14 hours, keeping the molds in the ripening box at about 65-75°F. 11. Unmold the cheese and sprinkle the top and bottom with salt, about 1/2 teaspoon each for the camembert mold size and less for the Mini-molds. 12. Place the cheese back on the clean ripening mat in the ripening box with the lid set askew, open to air circulation and keep at 45 - 50°F. Check the cheese daily. Flip the cheese over every day. After 4 or 5 days you will see the white mold growing on the surface. Contiunue turning the cheese over every day to allow the mold to spread evenly over the surface. (Handle the cheese carefully, using a plastic sandwich bag as a glove.) Also wipe out the drained whey with a paper towel. 13. After a week or so, when the cheese is completely covered with white mold, you can wrap the cheese in cheese wrapping paper. Keep in the ripening box in your refrigerator or at cellar temperature at or below 50°F until mature for approximately 4 more weeks. 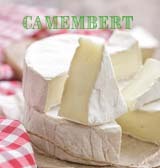 This soft ripened cheese is very similar to camembert, but is made in a larger brie mold with a supporting bottom. It can be made identically to the camembert instructions except you heat the milk to 96° F. after adding the cultures and cover for 90 minutes. Then add the rennet and stir, leaving covered for an additional 30 minutes before cutting the curd.